Paul opens his Letter to the Galatians with a defense. He is accused of making it easy for people to become a follower of Jesus, and bypassing beliefs, in this case circumcision. Paul sees no requirement by Jesus for circumcision and does not declare new comers need to follow this old code. Other leaders persuade the Galatians Paul is bending to a cultural ease. 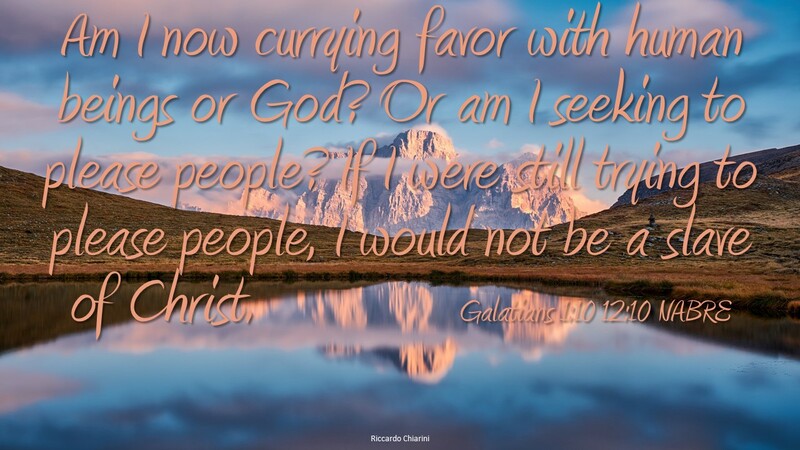 Paul’s defense; he does not look for favor from people, he does not try to please people, rather he lives for God, and to be a servant to Christ. He takes a lonely position but one he believes to be true. He is courageous but in his own eyes he thinks he is following the word of his teacher Jesus. Paul had many detractors and through discipline didn’t let any of them pull him from the truth of Jesus. Today we see many compromises when it comes to the teaching of Jesus. We live in a culture that is less Christian and more about bending to social norms. Doing something because everyone else does isn’t right, but it is easiest. Being a follower of Jesus doesn’t come with a life is easy card. In fact following Jesus in our current culture is harder than ever. We are under pressure to belong to a particular political point of view, to weigh everything by some standard that one side says is best and the other side says is harmful. People who call themselves Christian espouse more a political point of view than living like Jesus. Thus we have less people coming to believe in Him. Jesus message of love is more about forgiveness than correctness and condemnation. What are the influences in your life? Where do your guiding imperatives come from, social interactions or discipleship in Jesus Christ?